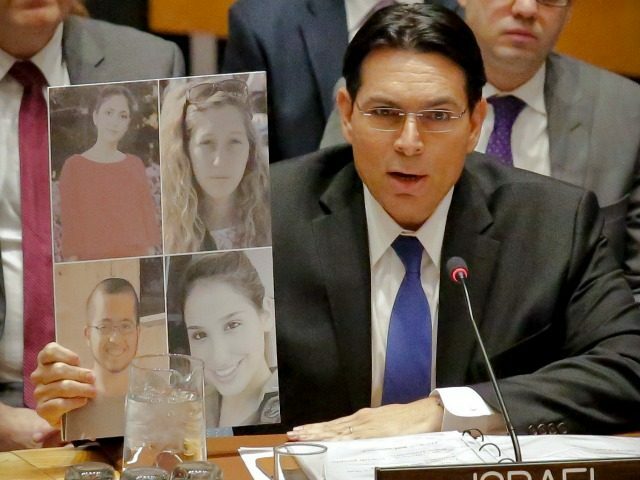 NEW YORK CITY — Israel’s Ambassador to the UN Danny Danon called Saturday for the United Nations to get tougher with Hezbollah, urging the Security Council to adopt a stronger mandate for the body’s peacekeeping mission in the region. The United Nations Interim Force in Lebanon (UNIFIL) was deployed to southern Lebanon in 2006, and its mandate was to make sure that the Iran-backed group did not use the area to stockpile weapons. The U.S. and Israel have called for a tougher mandate with a stronger focus on fighting Hezbollah. The mandate will be renewed this week. Despite UNIFIL’s focus, Israel and the U.S. have both pointed to signs on the ground and claims from Hezbollah itself that the group has amassed a large stockpile of weapons in southern Lebanon — weapons it can use to attack Israel. The U.S. Mission to the UN noted that, in April, Hezbollah fighters showed off weapons to journalists near UNIFIL’s headquarters. Both Haley and Danon have repeatedly grilled the UN over UNIFIL’s inaction, with Haley on Wednesday calling for tougher action. “UNIFIL has a vitally important mission. Regrettably, it is not pursuing its mission aggressively and the security situation in southern Lebanon has become much more dangerous,” Haley said in a statement before urging the Security Council to avoid a “business-as-usual” approach. Danon echoed Haley’s push for a stronger mandate for the group Saturday. “U.S. Ambassador Haley is correct. UNIFIL cannot continue to remain blind to the weapons buildup in southern Lebanon and they must put an end to Hezbollah’s Security Council violations to ensure calm in our region,” he said. “I call on the Security Council to adopt a more robust UNIFIL mandate that will address the serious security threats posed by Hezbollah,” Danon added. The argument over UNIFIL’s mandate taps into a broader claims by the U.S. and Israel that the UN focuses on criticism of Israel while ignoring Islamist groups. In July, Haley criticized the Security Council for obsessing over Israel while ignoring crimes by Hezbollah.